Chef Barry Wine created this renowned dish in the 1980's at his restaurant Quilted Giraffe. It was a mini crepe stuffed with caviar and creme fraiche and tied with a chive. These puff pastry pouches can be made savory or sweet. A sweet mincemeat filling, a spinach and feta mixture, chocolate chips and caramel, bacon and potatoes, curried chicken, smoked salmon and dill, the possibilities are endless. Heat butter or oil in an oversized saucepan on a medium flame. Mushrooms brown better in a larger cooking vessel. Saute onions 1 minute until translucent then add garlic and stir another 30 seconds. Pat mushrooms dry and saute with the onions and garlic 2-3 minutes until water evaporates. Add thyme, salt and pepper and cook again 1-2 minutes. Cool completely. Lay a large piece of parchment that matches the size of your baking tray on a clean dry surface and dust lightly with flour. Then roll out the puff pastry to a thickness of about 1/6 inch on top of the parchment. You will need to dust the pastry with flour a few times to ensure it doesn't stick. Using a 3 inch round cookie cutter cut 12 rounds. Remove the pastry around the rings. Using a teaspoon fill the center of each round with 1 teaspoon of mushroom mix and 1/2 teaspoon of soft goat or feta cheese. Once all the rounds have been filled gather the ends of each circle with both hands and bring them towards the center. Twist slightly to create a frill and then pinch together to seal. Pinch the base of the frill will also enhance the frill. cool 10 minutes and tie each pouch with a chive thread. Serve warm. Napoleons are another name for the classic French Mille Feuille, (thousand leaves referring to the many layers of a well made puff pastry), which consists of 3 layers of fine puff pastry layered and baked with pastry cream or creme patissiere and topped with a glaze of confectioners sugar. There are many versions of this dessert found all over Europe, some use caramel, others jams, some add a layer of sponge cake. This dish finds a mention in a 1651 French cookbook Le Cuisinier Francois but it is believed to have been modernized by the famous 19th century chef Marie Careme Antoine. In the U.S.A a simplified version of the Napoleon consists of tiles of puff pastry placed one of the other with various fillings. Napoleans make elegant individual desserts. You can use custard instead of pastry cream, you can add whipped cream to the dessert as well. If you use caramelized bananas you could enhance it with melted chocolate sauce and caramel sauce. Lemon curd with whipped cream is a delicious combination as well. Mushroom Napoleans are a delicious savory version. Napoleons are another name for the classic French Mille Feuille, (thousand leaves referring to the many layers of a well made puff pastry), which consists of 3 layers of fine puff pastry layered and baked with pastry cream or creme patissiere and topped with a glaze of confectioners sugar. There are many versions of this dessert found all over Europe, some use caramel, others jams, some add a layer of sponge cake. This dish finds a mention in a 1651 French cookbook Le Cuisinier Francois but it is believed to have been modernized by the famous 19th century chef Marie Careme Antoine. In the U.S.A a simplified version of the Napoleon consists of tiles of puff pastry placed one of the other with various fillings. Napoleans make elegant individual desserts. You can use custard instead of pastry cream, you can add whipped cream to the dessert as well. If you use caramelized bananas you could enhance it with melted chocolate sauce and caramel sauce. Lemon curd with whipped cream is a delicious combination as well. Mushroom Napoleans are a delicious savory version.Wondering how to make a quick and impressive dessert for a small dinner party. Napoleons are perfect. Buy the puff pastry, cut and bake. Seal pastry tiles in an airtight container and refrigerate. Get you hands on a good quality chocolate sauce, caramel sauce and whipped cream. Throw in some toasted nuts and a few beautifully caramelized bananas. Optionally poach fruit segments in red wine or use a good quality lemon curd with strawberries and whipped cream. Your guests will ooh and aah about this dessert for weeks! Preheat oven to 375F. Lightly dust a clean surface with maida or all purpose flour. Lay over it a piece of parchment cut to the same size as your baking trays. Cut the dough into two equal pieces and keep one covered with a damp cloth. Roll the other piece into a rectangle about 1/5 inch thick over the parchment. Using a sharp knife or pastry cutters or a square or rectangular cookie cutter cut out 9 squares or rectangles. Remove the excess dough and gently lift and place the parchment on the baking tray. Repeat the the remaining dough to create another 9 squares. and place them along with the parchment onto a second baking tray. 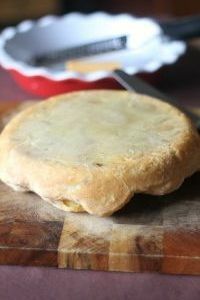 Brush the face of each tile of pastry lightly with beaten egg if desired.Bake until crispy and golden about 20 minutes. Remove and let cool completely. 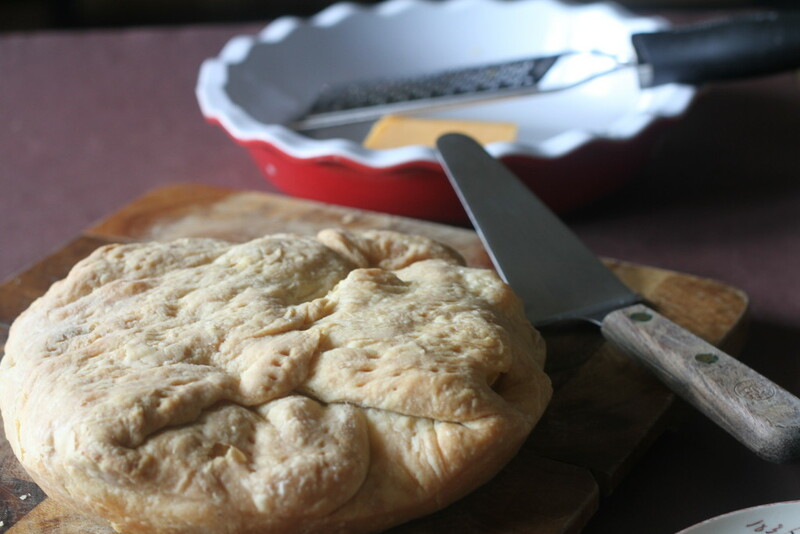 On an individual serving plate lay down one square of puff pastry. Using a spoon or if you want a more professional look an icing bag with a large nozzle dollop a tablespoon of pastry cream in the center of the pastry tile. Spread a little using the back of the spoon. Spoon over this cream a tablespoon of fruit compote. lay down a few small pieces of fresh fruit. Top with another pastry tile. Press down ever so gently so the tile sits comfortably over the cream and the compote. Repeat with cream and compote and smaller pieces of fruit. Top with the final tile and press down lightly. Place a few pieces of fresh fruit in a corner of the plate along with other garnishes like mint leaves and edible flowers. Lightly dust the entire plate with powdered sugar and serve immediately. Puff Pastry has been available freshly made and ready to use at City Bakery Worli for decades but not everyone knows this! It has so many uses including this quick and easy pizza piled high with fresh tomatoes and healthy greens. You can use homemade sauce or a pasta sauce from a jar. Do thicken the sauce before you spread it on the pizza. 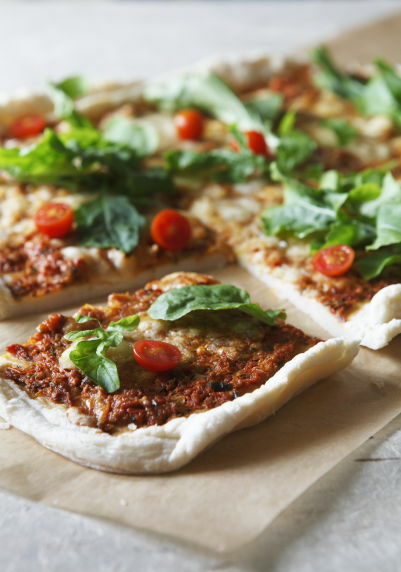 You can add almost any topping sliced meats, various cheese, sautéed vegetables and herbs. If you have health restrictions please consult your doctor before enjoying this recipe. If you are using a pasta sauce from a jar thicken it in a pan over a medium flame. Excess water in a tomato sauce can turn your puff pastry soggy. Let the sauce cool. Preheat oven to 375F. Set oven tray in the center rack. Lightly grease a baking tray Either a 12 inch round or a 9 by 13 inch rectangle. If its a little bigger or smaller thats fine too. Puff pastry does tend to rise more than pizza dough so the pan needs to have enough room to allow for expansion. 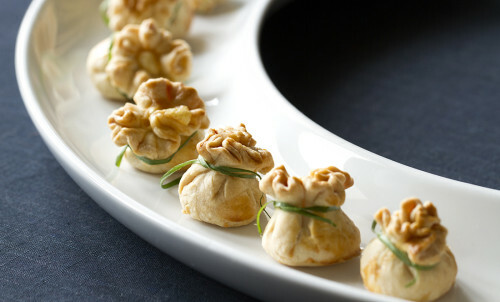 Dust a clean surface with flour and roll out the chilled but thawed puff pastry. Roll rom the center outwards to ensure an even crust. The pastry should be no more than 3/4 centimeter thick. Lay it out carefully on the baking pan. Smoothen put an bubbles by pricking them with a fork. Dot the pastry all over with small holes using the fork. If there are holes patch them up using a little extra dough. Bake 30 minutes until the pastry just begins to change color. Remove from oven. Spread the sauce at room temperature all over. 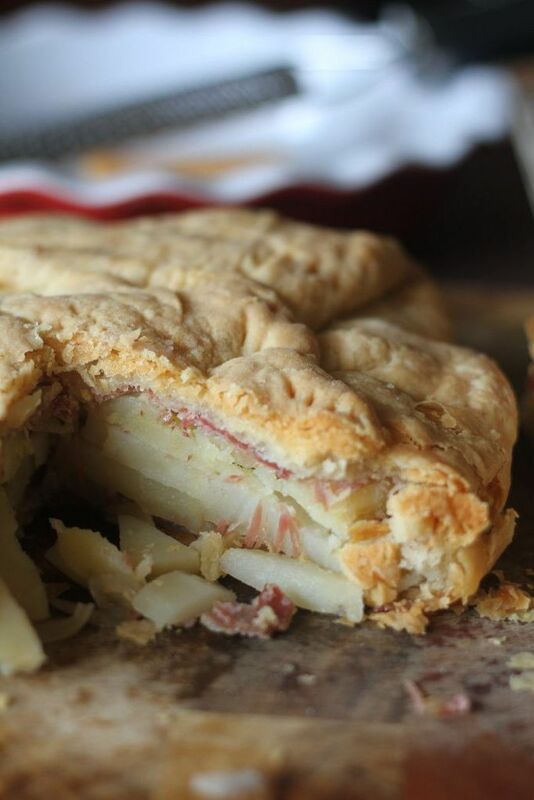 If you are using the garlic and the chill flakes stir them into the sauce before you spread it over the pastry. Scatter the cherry tomatoes-you can reserve a few for a fresh garnish as well. Add the cheese your choice, make sure it is evenly distributed over the sauce. Reduce heat to 350F. Bake again for 20-25 minutes until sauce bubbles and cheese has melted. Garnish generously with basil leaves, arugula and the remaining cherry tomatoes. Serve hot. Latke is traditionally a potato pancake made with potatoes, flour and eggs. It is associated with European and some Middle Eastern cuisines and variations abound. 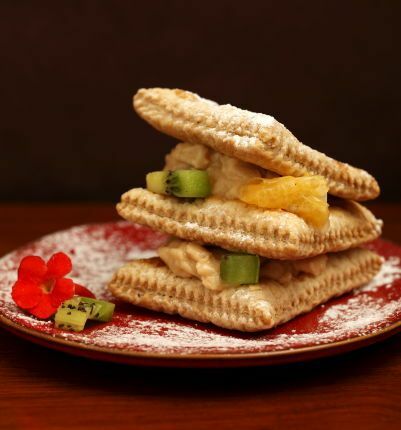 In Belarus where it is the national food they are called draniki, in Germany, Reibekuchen, in Hungary, tócsni, in Yiddish, latkes or latkas and in Poland, placki. 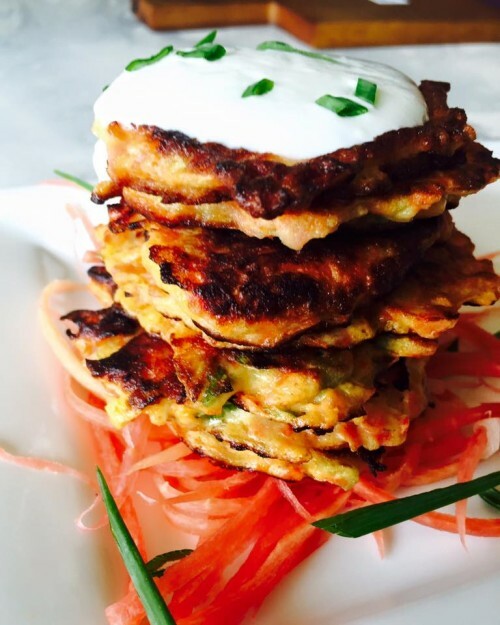 Latkes are very popular during Hanukah and there are many innovative and interesting combinations served with sour cream, apple sauce and various dips and sauces. I like to use potato flour in my carrot latke but if its not easily available to you substitute with rice flour. Preheat oven to 350F. Squeeze the water from the white onions and reserve them along with half the chopped green stalks. The remainder can be used as a garnish. Squeeze the water from the shredded carrots. Lay them on an oven tray and bake 15 minutes. This will help reduce the water content and give you a faster cooking and crispier latke. Let cool completely. Combine carrots, white and green onions, 1/2 teaspoon, salt, pepper, eggs and both flours. Incorporate well. The batter should be thick enough to scoop up and spread on a pan. Heat 2 teaspoons of vegetable oil in an 8 inch non stick frying pan on medium hat and place 1 heaped tablespoon of batter in the pan. Cook until golden brown on both sides. press down a little as it cooks to allow it to spread. Drain and taste for salt. If the batter requires more salt stir it in. Repeat this process to make about 12 latkes, 4 latkes at a time about 2 inch rounds. Add a little more oil if and when required. Turn over and cook until both sides are golden. Drain over paper towels. Whisk the sour cream and horseradish together. If you can't find horseradish use a hot sauce or chili paste. Taste the accompaniment for salt. Serve with warm latkes. Garnish with the leftover green onion stalks. Pâte brisée is a French short crust and can be made sweet or savory. This is a savory crust. Pâte is paste or dough in French and brisée is to break. The butter is cut into pieces and the flour is mixed into it ideally by slowly breaking the butter into the flour. In warmer weather like India this recipe works well because the dough should be shaped as a slightly flattened disc rather than a ball so it chills faster and is easier to roll out. In hot humid weather it helps to chill the knife and fork one plans to use as well as use a metal or glass bowl thats been chilled in the fridge. The cooler the ingredients and the less the flour comes in contact with warmth, which means handling it as little as possible the lighter and flakier the crust will be. In a large mixing bowl use a fork and a knife to blend the flour, the butter, and the salt until the mixture resembles breadcrumbs. Sprinkle 2 tablespoons ice cold water, toss the mixture until the water is incorporated, then add another 2 tablespoons of cold water and using your finger tips form the dough into a flattish ball. Knead the dough very gently for no more than a minute. Do not press the dough down too hard. Slowly distribute the fat and roll into a round and slightly flat disc shape sing your finger tips lightly. Wrapped the dough in a clean, dry, air tight plastic bag or container and refrigerate 75 minutes in warm weather before it is ready to roll. Roll and bake as per the requirements of your recipe. Depending on the filling, the kind of pie or tart dish you use temperatures and quantities will vary. This recipe makes a wonderful Sunday lunch if you serve it with a simple green salad. I'd suggest my French Vinaigrette whose slightly acidic flavors complement the sweet onions and potatoes. It's important to brown the onions well and release the delicious sweetness, which will find its way into the salty and starchy potatoes. 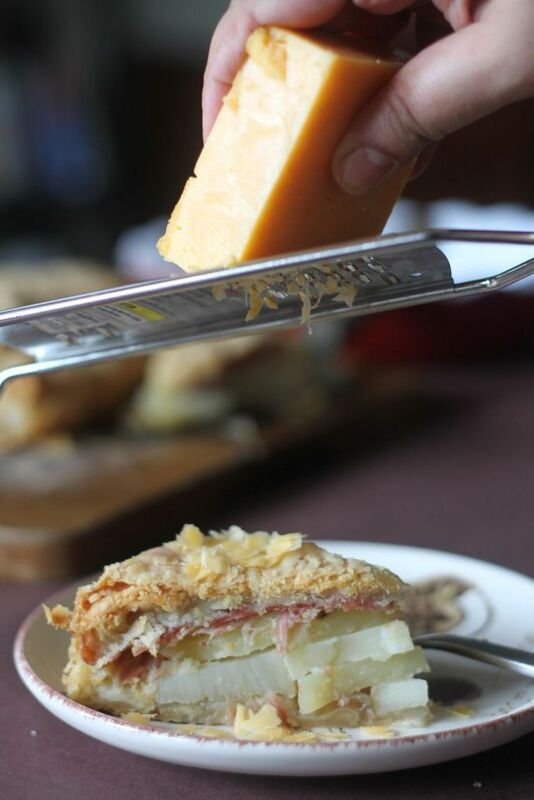 The cheddar is optional as is the meat but its sharp taste adds a little kick to this. 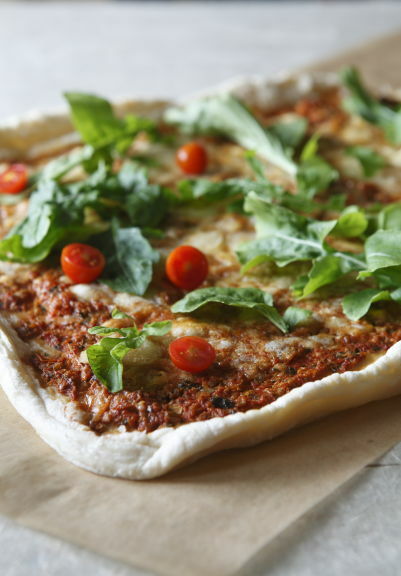 This can be made entirely vegetarian with arugula. The spicy leaf complements potatoes wonderfully. A crisp white wine or a light red work equally well with this one dish meal. Slice boiled potatoes into thick 1/2 inch rounds. Keep covered and refrigerated. Melt oil and butter in a large skillet on medium heat. Add onions and stir until golden and caramelized about 10-12 minutes. If you are using uncooked bacon bits add them now. Add hot sauce, oregano and pepper. Add salt carefully as cured meats and bacon and some kitchen butters and cheddar have plenty of salt. Add potatoes and stir gently to avoid breaking potatoes. Coat potatoes in the onions so they absorb the flavor and salt. Taste again and season as desired. Preheat oven to 350F. The pie will bake in the middle rack of the oven for approximately 35-45 minutes. Flour a clean flat surface generously. Roll out the chilled dough into a 14-15 inch circle. Fold the sides gently and lift the dough into a 9 inch pie dish. Unfold the dough and let sides hang out of the pie dish. Dot the bottom of the crust lightly with a fork. Slowly pile the potatoes and onions into the dish, spreading them evenly. If using a cured meat layer the top of the potatoes. Otherwise spread the chopped Arugula over the potatoes. Carefully lift each side of the dough and bring it together to seal the pie. Overlap the sides leaving a small vent open in the center for heat to escape from the filling. 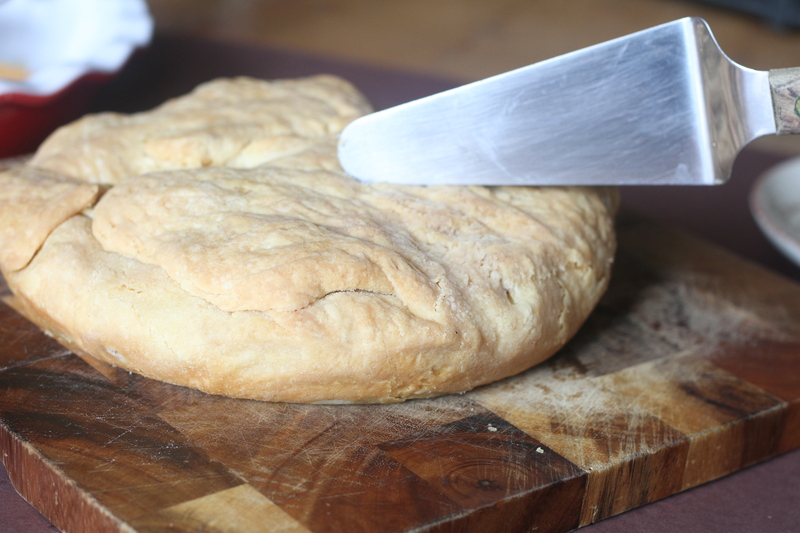 Lightly dot the top of the crust with a fork to prevent excessive puffing and cracking of the dough when it bakes. Brush with beaten egg. Bake until golden brown. Remove from oven and let sit at room temperature for 15 minutes. Gently unmold so the folded side is face down. Carefully using a large flat spatula turn the folded side over. Slice and serve with freshly grated cheddar and a simple side salad. A flavorful combination of roasted lentils, grains and spices. Meth refers to dried Methi or fenugreek seeds and the word Koot means to grind or powder. A classic from the state of Maharashtra where many signature dishes contain a nutritious combination of lentils, nuts, seeds and grains. Every home has their own recipe. This was my grand aunts version from Pune. Traditionally stirred into mashed, boiled white rice with hot ghee. It is also eaten with flatbreads in the same way pita is eaten with Dukkah. It can also be stirred into yogurt to make a tasty dip. I also toss a teaspoonful into boiled lentils to add flavor. its also great with roasted vegetables and mashed eggplant. In colder climates it can be stored at room temperature for several months in an airtight jar. I keep mine refrigerated in humid weather. Roast the wheat and rice grains in a dry skillet on medium heat for about 6-8 minutes, till golden. Set aside to cool. Add the dals to the skillet and roast them on medium heat for 6-8 minutes, golden. Set aside to cool. Add the remaining ingredients, except the oil, mustard seeds, asafoetida powder, salt and sugar to the same skillet and roast them on medium heat, till fragrant and golden. Set aside to cool. Grind the cooled grains to a fine powder. Add the dals and grind again to a smooth powder. Add the remaining roasted ingredients and grind once more to a smooth powder. Put the oil in a small pan on medium heat. When hot, sauté the mustard seeds and asafoetida powder for about 30 seconds. Cool and add the contents of the pan to the powdered mix with the salt and sugar and grind again. Taste for salt. The mixture must be slightly salty as it is eaten with plain, unsalted boiled rice. Store in a clean, dry airtight container. Refrigerate for up to 1 month. This dish uses a flat, legume called cluster bean or Guvar/Guar/Guwar that has a pleasantly bitter taste and complements the sweet flavor of Indian apricots. Indian apricots or jardaloo taste and look different from their Turkish counterparts. They can also be bought whole and dried and must be soaked to soften them. The nut is particularly sweet. It may come as a surprise to some but many almond liquers and biscuits use the extract of apricots seeds to flavor their products because of their sweeter taste. Turkey is the largest exporter of apricots. In India Jardaloo is also harvested in Kashmir and not to be confused with Aloo Bukhara, a kind of plum. Non organic apricots turn brown on account of treatment with sulphates. 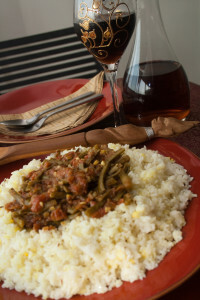 This dish can also be served with the vegetables in the center and the rice around it instead of layering it.If you have allergies or health restrictions please consult your doctor before enjoying this recipe. Remove the apricots from the hot water. Discard this water as it may contain sulphates used to dry apricots. If your apricots are organic and sulphate free then you can use the water to cook your vegetables. Peel the apricots and chop the skins into little pieces. Reserve. Crack open each nut and save the small, sweet nut inside as a garnish. In a pressure cooker or Dutch oven style pot heat 2 tablespoons vegetable oil. Add the green chillies and saute 30 seconds. Add the toor dal and rice and stir gently. Add turmeric, a teaspoon of salt and 3 cups of water, if using a pressure cooker and 4 cups if using a Dutch oven. Cook for one whistle or for 20 minutes on medium heat in a covered Dutch oven pot. Remove the cooked rice and spread it out on a plate. Fluff with a fork. 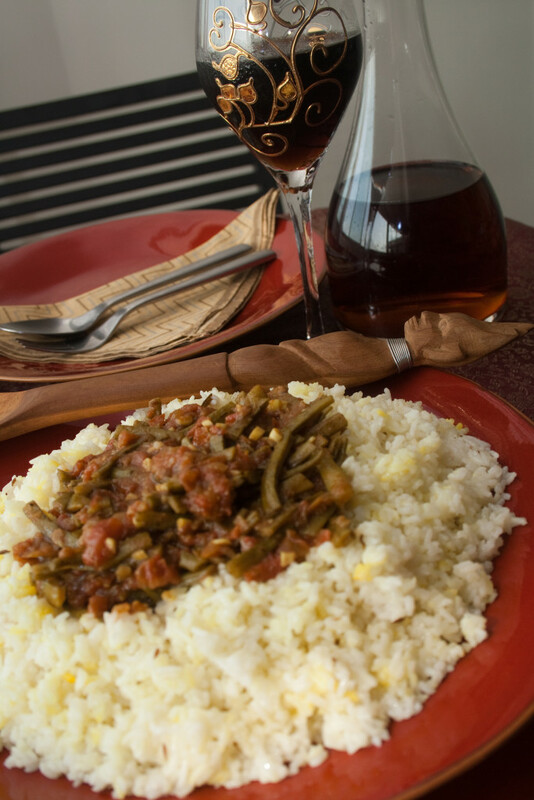 While the rice simmers in a dry skillet heat 1 tablespoon oil and roast red chillies, garlic, ginger, cumin and coriander until bubbly and fragrant. Cool and grind to a smooth paste. Add tomatoes and onions and grind to a smooth puree. Heat two tablespoon vegetable oil in a large saute pan. Add the puree and cook until oil separates from the masala and the tomatoes are soft and pulpy about 12-15 minutes. Stir regularly to prevent burning. Add guvar, apricots, coconut milk or water and cook until vegetables are tender. Turn off flame and immediately stir in shrimp and allow it to cook in the heat of the vegetables. This prevents over cooking of the shrimp. If you aren't using shrimp you can use crispy fried or plain, boiled and peeled cooking potatoes. Salt to taste. lightly grease a serving dish that can either be put into a steamer or is microwave safe to reheat the pulao. Layer first with half the cooked rice followed by the shrimp and guvar and top with remaining rice. Press down on the top layer with a flat ladle. Cover and refrigerate if you plan to eat it later. Steam 15 minutes just before serving or microwave until piping hot. Garnish with fried onions and apricot kernels.